The Executive Hockey League, founded in the Fall of 1973, owes its existence to the efforts of John Labute who conceived the idea of forming a no checking hockey league for men over 30 and carried it out with the backing of many other residents of the Town of Mount Royal. Town recognition for the league was obtained with the enthusiactic backing of Mayor Reginald Dawson and Councillor Victor Podd. 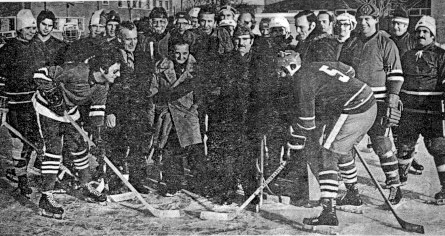 To gain credibility, the league agreed to play outdoors for the first year, the first game being played at 8:00 A.M. one sunny Sunday morning in January 1974 with Mayor Dawson dropping first puck. There were four teams (Americans, Millionnaires, Maroons & Senators) the first year, each having 16 players. The first executive consisted of Nick Timeotheatos (President), Richard Shatilla, Gerald Murphy and John Labute, it being agreed on that the President should be a non playing member. In subsequent years, the league moved indoors and has six teams with a total membership of over 80.